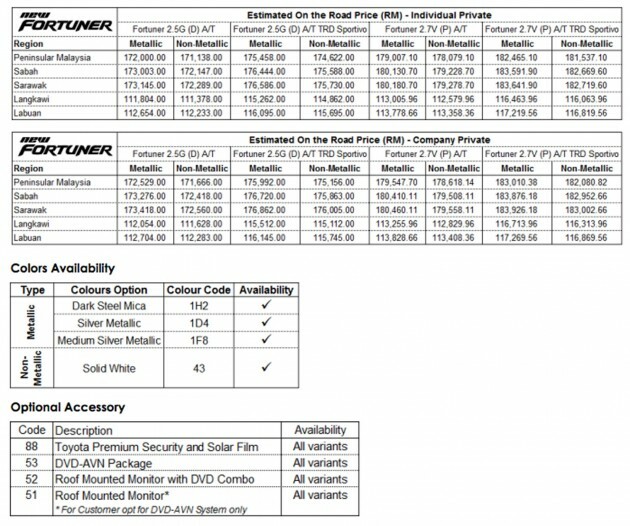 UMW Toyota has announced the estimated on-the-road prices for its Toyota Hilux pick-up truck and Toyota Fortuner SUV 2012 model year improvement models, which are due, we hear, soon, with bookings now open for the two vehicles. The Hilux facelift arrived last September, so don’t expect that there to be radical changes to features and kit. There’s a noticeable revision in power output though, specifically for the 2.5 litre Double Cab model. A check on the UMWT website says numbers for the 3.0 Hilux’s powertrain remain as is – the 1KD-FTV D-4D commonrail diesel with Variable Nozzle Turbo continues to offer 163 PS and 343 Nm of torque from 1,400 to 3,200 rpm. The Hilux Double Cab 2.5G, however, has now gone the VNT route, and features a higher power and torque output courtesy of its 2KD-FTV mill, these being 144 PS at 3,400 rpm and 343 Nm at 1,600 to 2,800 rpm. This is a significant increase from the 102 PS and 260 Nm from 1,600 to 2,400 rpm as seen in the facelift that arrived last year. The four-speed ECT transmission has been retained for the automatic variant, according to data from the website. good updated for toyota.. but if we buy this.. the all new hilux will coming soon with this VNT engine. T always step behind of other car maker like mitsubishi, nissan, ford and mazda. There will come out more powerful engine compare to T. Dun believe?? wait and see…haha..
hilux has always been consistently one of top selling non national makes no matter how hard ford, nissan, mazda and mitsubishi may try. i doubt many have jumped ship. a few maybe, yes. Finally, after taking advantage from the customers for how long already. new ford ranger 2.2 TDCi got 150Ps With 375Nm of torque. and road tax only rm 598,new bigger body and latest tech. toyota should change a newer model since this model almost 8 years from 2004/05. Not only full model change for that pickup truck. Change the engines under the bonnets too. Europeans already ditching such low power (their standards) diesel engines. It’s sibling, the Mazda BT-50 has a higher equipment level at a slightly lower price, worth checking as well. Duit aku. Aku pakai. Agree or not, its still the most reliable pick-up truck in Malaysia. u mean other pickup in malaysia market no reliable as hilux?? i dun think so… time will prove you are wrong..
you go to ulu-ulu area at sarawak, says mukah or kapit and you will see more hilux as compared to other pickups. Why? Think for yourself. Toyota easy to loan, Not like ford car easy to trade in. Payment easy. Not like ford. Spare part, abundant even almost anywhere to be found. If rosak in ulu, can ask log co people ask for help, all their car 99% toyota. A very convenient. Even most villagers knows how to troubleshoot. Lol. Tht was the last until sr non commonrail. The mechanic knowledge about hilux almost 99.9% i guess, not like ford. Sometime they guessing too much without knowing most of it (ford). Ford must educate n turun padang (after sales serv) in order to see the situation tht will improve their sales. This is the right time to buy hilux. The last face lift for hilux make it looks bolder and more macho. after u buy.. in 1 or 2 year time. All new hilux come out.. but u still worth it cos the All new hilux also will using this VNT egine… hahaha.. go ahead..but market will come out many choice and more powerful compare to T.. I learn from my previous experience.. The best truck currently is FORD RANGER WILDTRACK. Hope the upcoming Everest is as good with 6 to 9 airbags and ESP. Many vehicles above RM150OOO have no ESP. This is Malaysia boleh. Olympic gold medal vs ESP in all vehicles as a must, which one will I choose? Cannot understand why it is so difficult to get a wildtrack? If there is very high demand for this truck, surely Ford should seize the opportunity to bring in more units. Isn’t their objective to sell more vehicles?? Had Ford T6 has enough stock and 2.2 got TCS & DSC, selamat jalan outdated engine Hilux. UMW should offer this engine since 2005 model. great car to lose within a week after buying. too hot in black market. @ahma – unfortunately i have to agree with you. My friend’s truck got stolen recently. The thief actually tailed him from the office parking lot to the Mosque where he performed his Friday’s prayers. It was gone when he got back. Thieves preferred stock standard model, without modifications. If u test drive both Hilux n New Ford Ranger…you will surely dump Hilux…i didn’t believe it until i drive both :-)….Ford Ranger wins in every expect n maybe loose in 2nd hand value(only in Malaysia)…but am quite the 2nd hand value for new Ford Ranger will be good due to the HUGE demand all over the World..huhu. the price is killing the us.. a 2.5 VNT with a 140PS just priced around 103k??? better buy the ranger 2.2 rather than this..
coming up in 2013 … Hilux with ESP. That s all , the rest stays the same. Nevertheless, its gonna to be in top of the sales again , not only in Malaysia but also in Thailand and Australia too. yes,, i still the best seller but the gap with other competitor are closer. -it is true in thailand ! but just imagine some old 8 years model still conquer the market ! toyota not even release their totally new hilux !erm,when totally new hilux will coming ? 2014 ? I can’t speak from experience in relation to the current Ford Ranger, but a neighbour of mine sold off his at 200k km mileage. The reason was that the transmission broke and needed replacing, a costly sum. The mechanic told him that it was common for the Fords to do this. He has since bought the Hilux and at about 400k km on the clock, no issues. Note that this is only hearsay, but it is worth taking note of. It’s not necessarily about power, but more so reliability. These are commercial vehicles, aesthetics aren’t high up on the priorities. The market for these commercial vehicles is dictated by reliability over a long period and high mileage more so than anything else. This is one of the factors which the buyers catalogue will not contain, viz., when will it break down. Another factor that should be noted. Not infrequently does the purchaser actually buy commercial vehicles for their hired men, lorry drivers or labourers to drive, it’s not for their own driving pleasure (they have X5s and Cayennes for that). So as an employer, why pay for 6 airbags for a hired hand when I only need to pay for 2? Why bother with additional features of leather etc. when it will only get soiled from grease and dirt? Why would the driver need the additional horsepower when he’s not even carrying anything past 500kg and there’s no trailer at the rear? The considerations of the commercial market are quite different to the mass consumer market vehicles for personal use. Maybe it’s time to give up the bickering on paper and actually let the sales numbers speak for themselves? Or when you drive 300k km a year on dirt paths and in farms, then maybe you’re qualified to judge the vehicle’s worth. No doubt, each of us are entitled to opinions, but cut the redundant comments. On an end note, it’s worth noting that in spite of torque figures and paper claims, look at the farmers in Cameron Highlands, they drive decades old Defenders still. If it’s your bread and butter, you go with what works and what continues to work, not merely for figures and numbers provided with unproven technology in your particular geographical location. good point. can see a lot of the farmers in cameron running the past generation hilux as their most preferred pickup. my in law (land surveyor) that frequently went out for weeks across dirt roads also prefer the previous generation hilux to the current higher powered pickups. silwen, yours is simply on the assumption that the market is all for commercial/heavy work. You turn blind eye on the current trend where some people start to utilise the pick up truck for their trade and personal drive. Hilux only have commercial/heavy work in their mind. Newer model in Colorado, Ranger, Navara serve emerging market. At least these new models provide improvement in their product. Not enough to topple Hilux, but it doesn’t repel the fact that Hilux barely improve its offering over the decade. And that’s what I call arrogant! Uiks ! i own new facelift medium/silver manual ! i like my luck and i’m not someone uncle !..30 years old ma !….my second luck will dark steel mica with auto…i have no desire with other ”brand” pickup even their come with twin turbossssss…respect each other k ! I used to own a Toyota Landcruiser ll, 2.4 liter petrol engine. I fitted it with off road suspensions, step bars,winches,etc for many off road excursions. Now that I have ‘retired’ after 14 years of off roading, I wish that Toyota would come out with a 2.0 L engine, which is cheaper for road tax, more environmental friendly and suitable for the urban jungle and light weekend offroading. Fortuner still have side folding 3rd row seats which uses lots of space. While other car makers have already implement 3rd row seats which folds neatly into the floor. It’s one of many reasons why people buy Pajero Sports (for example), unless for those who gets the Fortuner just because of the T badge and don’t really care of it’s impracticality. i was using hilux 2.5 for more than 5 years.. sold it and change to Navara.. but with stock spring navara failed offroad.. mounting loose just 12km drive on gravel road.. now got electronic 4wd switch problem.. Using 2004 Hilux, done 300k km, chipped. Major part problem was that long shaft “clink clink” sound. Other then that, no problem at all. Lux is bit bumpy, less powerful and look “traditional” compare to all said 4×4 pick up in the market. But it gave me confident to take it to jungle, expedition, n farm. In term of spare part, who driving Navara will regret for is fuel nozzle problem, clutch burn. Who get tritton will regret for it wira style of seat n wira style of dashboard ‘klap klap’sound, foot rest is worst. For ford, i never own one, but at the current the Wide Track would be my first choice when my SR retired. Isuze D-Max, good and reliable workhorse, fuel consumption also the best. no comment. Just i like T brand more then I when both of them come so close. Come to workhorse n pick up truck, most important is torque. Top Speed, high HP seen like marketing purposes only. Last year i asked T salesman if they will bring in this engine to Malaysia, they answer no! So end up having the old engine car. And the car now just 7 month, Erm, should i change my car? malaysia always been a place for T to dump the old engines, while thailand, australia & the rest of the world got a new hilux with new engine, new gearbox, VNT & intercooler turbo, malaysia only got a new hilux with old engine & gearbox…haha T boleh. i believe it is the same issue with altis dual vvti in thailand but only vvti in malaysia? While others makers from japan, korea & europe did introduce their latest model to the world and to malaysia without giving us outdated engines & gearbox. we may be not rich that’s why we buy pick up truck & we let them robbed us in a broad daylight…..just my humble opinions, care to disagree…..
You all are right, pickups are getting popular with non trade buyers. Just got to remember boys and girls, all that power is not in a car so don’t drive the pickup like that. It’s dangerous! The pickups nowadays are really beautiful with all the comforts and gadgets. They have come a long way since the mid-1980s. All you new buyers are blessed with great choices. Enjoy and have fun carrying stuff around without any space limits. This new hilux is great to have come with the new engine, it’s a strong and reliable engine. Ford, nissan, and Chevy are technical marvels. The D-max is simple and light. Since my first Datsun the current pickups are like night and day…..so many good choices and features….old man oledi confused lah. 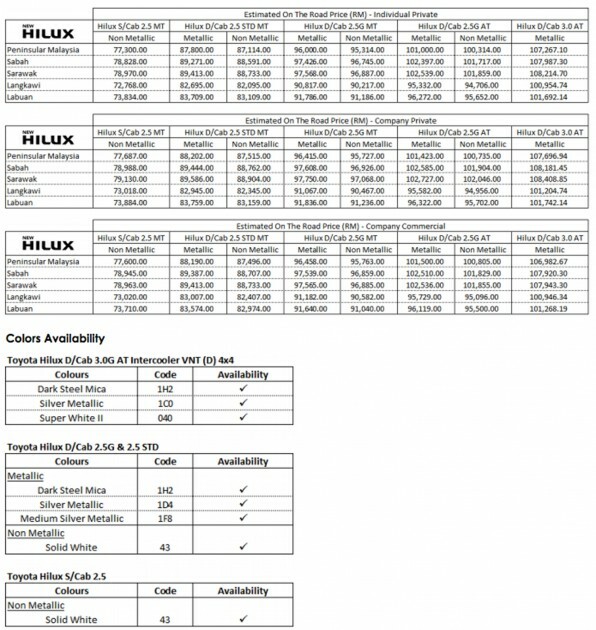 just bought my hilux 2.5G last march… can put VNT systemkah at the hilux? Mr Paul Tan or anybody can give me the answer? Can but the cost is RM 11,000 or RM 12,000 at Thailand. If want halfcut engine is RM 7,000 – RM 8,000. With that kind of money there are better mods out there. I’m currently looking for a half cut Vigo 3.0 to have shipped overseas. Any supplier suggestions? Need to change or remap ECU. The common rail timing is much different than non VNT turbo kit. that expensive ho… not worth it lah if like tht.. can put only inter-cooler system only kah? i read about vector tuning box for commonrail engine.. is it somekind that you will recognize? or maybe long term not good? wht mode would u advise? I give you good suggestion. Fact is, common rail in Toyota KD engine are using 2nd gen injectors and ECU. It just can’t really face high force and thats why you will see triton produce black smoke when push pedal hard. It is because no complete combustion in the engine on high stress level with high torque. Same goes to Ford’s 2.5 TDCi. T use low HP and Torque in 2.5 because they want to eliminate stress which increase engine reliability. Isuzu engine are also low HP and Torque but reliable. Only nowadays people demand on HP and Torque which makes them win in the road. In long term, they will face problem like navara problem with injectors. Please don’t use tuning box. One of my friend complaint fuel consumption and black smoke in their ford ranger 2007. In the end, trust me 2.5l, 102 HP still tough like the old hilux. Penggunaan Intercooler VNT Turbo tidak akan menyebabkan pembakaran enjin tidak lengkap..tetapi sebaliknya..Ada prbezaan enjin yg dibantu turbo untuk mencapai HP yg tggi dgn enjin yg dipaksa utk beroperasi secara intensif(mggunakan cip/computer box tuning/etc)..Turbo menambah kuantiti udara yg msuk ke dalam ruang pembakaran..utk mempercepatkan pmbakaran dan lebih efisien.. I own 3 years old 2.5d4d auto version hilux. I want to upgrade for 7 seater fortuner. I still get confusing when i tried pajero sport n fortuner both in my test drive trip. if pajero sport resale price is also like T version surely i will buy pajero sport. But i dont like the interior color of pajero sport. Who think for performance is pajero sport but for resale price toyota is leading. Wondered when first saw Ford Ranger came with 2.2L, with such high power 150PS. Hilux 2.5 is only 102, with VNT up to 142. But Toyota actually has 2.2L engine 2AD-FHV which can go 177BHP, used on car models and RAV-4 abroad. Sure Toyota has its reasons not using it on Hilux. Reliability is more important that raw power output. There’s also 2.0L (1AD-FTV) tuned to 126BHP if Toyota wants. Those engines can reduce Road tax too like the Ranger 2.2. Toyota’s mind always using older engine and turn them reliable. AD engines are small but high output for those sedan and light SUV because the fact is small engine are not suitable for high stress on towing. Even it produces high HP and torque, it is use for great acceleration and top speed where big capacity engines with low HP and torque are for towing and durability. You will seldom see a sedan car towing a boat because car manufacturer leave the job for truck with higher engine capacity. Towing of course depends on the torque but towing could cause massive engine stress. Smaller engine usually operates higher rpm therefore wear and tear could happens easily when stress comes. I wanted to buy an 4wd for long distance driving purpose. Already test drive Fortuner 2.5 & Pajero Sport VGT. Now, am thinking which one will be the best. Can anyone give me advice which is the best option between those two? Have anyone compare the fuel consumption between this two 4wd? boleh kah hilux commandrail turbo tukar intercooler VNT dan berapa cost penukarannya? saya ingin memasang intercooler pada injin hilux saya( VNT )ada apa-apa yg perlu di ubah? Next Post: Volkswagen Polo 1.2 TSI Review – worth two Myvis?